The Eric Carle Museum of Picture Book Art invites guests to explore the art of the picture book through rotating exhibitions in the Museum’s three Galleries, our Art Studio, and our Reading Library. Exhibitions at The Carle are designed to underscore the cultural, historical, and artistic significance of picture books and their art form. The Carle strives to meet the educational needs of all groups. Our programs are designed to support the Core Curriculum and Standards for art education, focusing on careful observation, critical thinking, and discussion. 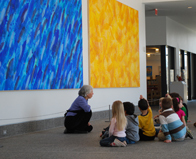 Field Trips include a brief museum orientation followed by both Gallery and Art Studio experiences. Field Trips last approximately 90 minutes, with about 40 minutes in each space, depending on the age of the participants. For more details, including reservations and pricing, see Field Trips. Adults eager to enhance their group’s visit should consider a guided tour. Guided tours highlight the work in the exhibition of your choice, allow time to browse the other galleries, and include time spent in the Art Studio exploring the creative process. For more information on guided adult visits, including reservations and pricing, see Guided Programs for Adults. The Carle also offers workshops and training for educators throughout the year. For more information about upcoming opportunities see Programs for Adults & Educators. Self-guided groups will be given a brief orientation, followed by an opportunity to visit the Museum’s Galleries, Art Studio, and Reading Library. We encourage those organizing a self-guided program to be familiar enough with the Museum to provide a context for the visit. For more information and to reserve your group visit, see Self-Guided Programs.